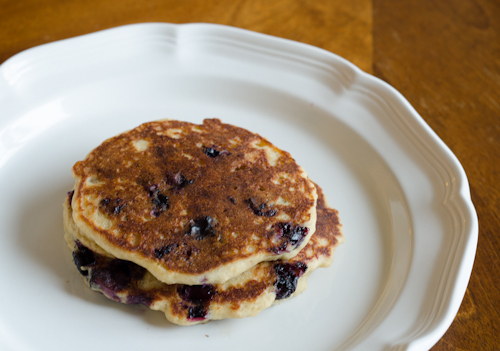 My daughter loves blueberries and pancakes, so I made her blueberry pancakes this weekend for breakfast. This recipe is adapted from the basic recipe in King Arthur Flour’s cookbook. I’ve been trying to use different whole grains besides just whole wheat, so I made this with millet flour. I couldn’t believe how incredible they turned out. You know that heavy feeling you get after eating pancakes? Like you swallowed a sponge that’s expanding in your stomach? Or maybe it’s just me. Regardless, the millet flour made these light and airy on the plate and equally light in the stomach. They puffed up beautifully as they cooked. The millet added a natural gold hue to the pancakes that was a softer shade than corn and made them look even tastier. I used Bob’s Red Mill millet flour. They usually keep it stocked at my local health food store and in the natural food sections of the larger grocery chains. I would have used ground flaxseeds instead of the egg-replacer, but I hadn’t been out to the store to get any yet. If you have that, feel free to use that instead of the egg-replacer. Combine the warm water and egg-replacer in a small cup and mix until it thickens. In a large bowl, combine the milk, vanilla and egg-replacer mixture and beat until foamy. Add the earth balance and blueberries and stir without breaking the blueberries. In a separate bowl, whisk together flour, vital wheat gluten, baking powder and sugar. Whisk briskly so that the ingredients are evenly distributed. Pour the dry ingredients in to the wet ones and use a spoon to gently fold everything together. Mix just until the flour is moistened, but there wills till be clumps. If you have time, let it stand anywhere from 30 minutes to overnight. You can make them immediately if you want, but I think they come out tastier and fluffier if you let the batter rest a bit. Heat a griddle or non-stick frying pan over medium heat. Once it’s hot, ladle in the pancake batter. When it’s ready to flip, the top will bubble and half way up the sides will look cooked. Carefully flip it and allow the bottom to cook.